Before us is a significant opportunity to reimagine the federal government’s leadership role in homelessness. After more than 25 years of declining spending on affordable housing, the Government of Canada is launching a National Housing Strategy (NHS) with a 10-year investment in expanding the supply of affordable housing and enhancing sustainable longterm housing outcomes for Canadians. A key pillar of the NHS will be a renewal and redesign of the existing Homelessness Partnering Strategy. The last renewal of HPS in 2013 saw the Government of Canada play an important leadership role in mobilizing the results of the At Home/Chez Soi study to expand the implementation of Housing First across Canada – in essence, opening the back door to homelessness. As we turn towards a reimagined national strategy on homelessness, the Government of Canada has an opportunity to show leadership by closing the front door, through supporting a shift to homelessness prevention. This means stopping the flow of individuals and families into homelessness, and at the same time being unwilling to wait for such persons to find themselves in desperate situations — situations that can cause irreparable harm — before we help them exit homelessness. The renewed national strategy on homelessness can help make the shift to prevention through supporting communities to act quickly and creatively, to prevent homelessness before it ever begins. Toward this end, the Canadian Observatory on Homelessness (COH) submits a bold vision for a national initiative on homelessness prevention, within a new national strategy on homelessness. The vision presented here can assist the Government of Canada in its commitment to preventing and ending homelessness for generations to come. 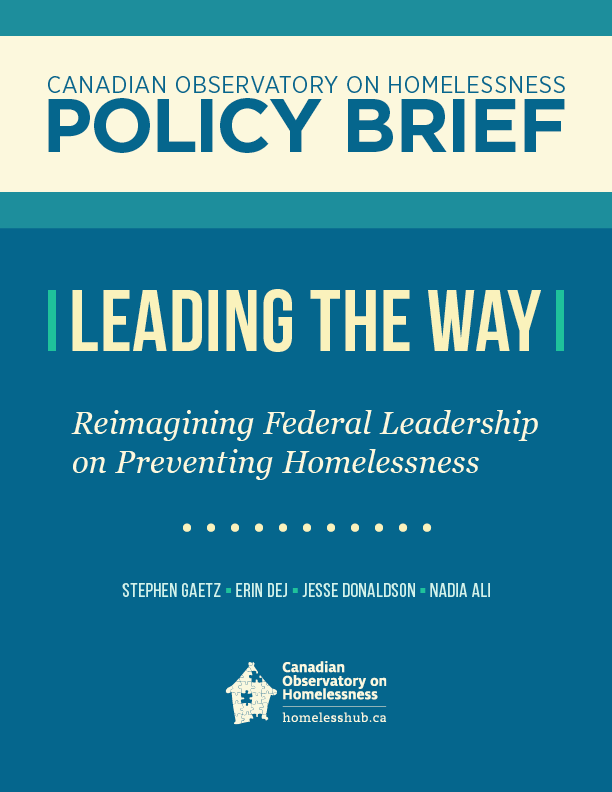 Can the Government of Canada play a leadership role in homelessness prevention? How can the prevention of homelessness be prioritized within a reimagined national strategy on homelessness?